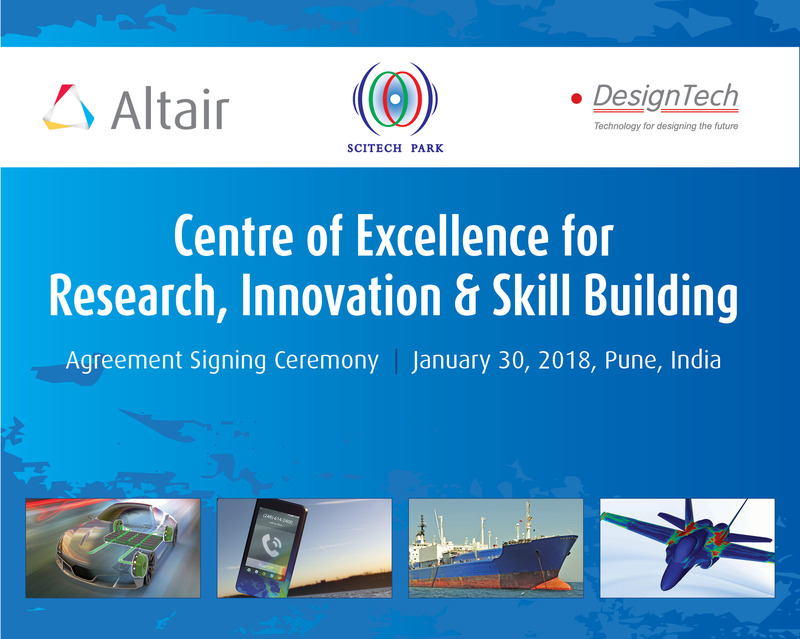 Pune, India, January 30, 2018: US based Altair Engineering (NASDAQ:ALTR) announces a collaborative effort with its partner in India, DesignTech Systems, and the Science and Technology Park, an institute supported by Dept. of Science and Technology (DST), Government of India, to support the advancement of the Govt. of India’s Skill India programme. The objective of this Skill enhancement programme by the Government, is to enable a large number of Indian youth to take up industry-relevant product design skill training that will help them in securing a better livelihood. The agreement to establish an Engineering Centre of Excellence (CoE) for research, innovation and skill building, is therefore expected to benefit a large community of students, Academic Institutes and overall Industry. Altair has been supporting various education & research initiatives under its Global Skill and Innovation development initiative to harness the technical education eco-system through its experience in the industrial products and services. For more information, on these initiatives, please visit – https://altairuniversity.com/industry-outreach. Science and Technology Park, Pune is one of the Science and Technology Entrepreneurs Park (STEPs) set up in the year 1986, and has been supported by National Science and Technology Entrepreneurship Development Board (NSTEDB) of Department of Science and Technology (DST), Government of India, within the campus of Savitribai Phule Pune University. A not for profit Trust & Society. The Scitech Park is a prime center on the campus of university to promote techno-preneurs by way of entrepreneurship awareness and training, technology development and incubation of hi-tech start-ups. The Scitech Park facilitates IPR and Technology management, Industry sponsored research, providing technology inputs for various governmental and industrial developmental projects. For further details please visit https://scitechpark.org.in/. ALTAIR (Nasdaq: ALTR) is focused on the development and broad application of simulation technology to synthesize and optimize designs, processes and decisions for improved business performance. With more than 2,000 employees, Altair is headquartered in Troy, Michigan, USA and operates 69 offices throughout 24 countries. Altair serves more than 5,000 customers across broad industry segments. To learn more, please visit www.altair.com. DesignTech Systems Ltd. is a leading CAD / CAM / CAE / PLM Solutions, Additive Manufacturing Technologies, and Engineering Services provider from India. With more than 19 years of experience we have been working with companies from cross vertical domains from India and overseas to support them in their most complex and challenging engineering initiatives while helping them derive best returns on their investments. For further information you can visit us at www.designtechsys.com.